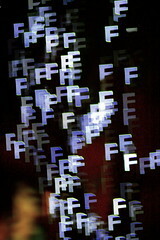 In a photo with many unfocused points of light in the background, the points blow up into large circles. This happens because of the physics of how light focuses through a camera lens, and the round shape of your aperture. If you look at these points from pictures taken with different lenses, and the aperture isn’t wide open, you can count the hard edges of these circles and tell how many aperture blades the lens has. Flickr user goodbybysunday has posted a fantastic guide to modifying the shape of these out of focus points using something as simple as card stock! I can’t wait to try this out… and I’m sure that I’ll have a stack of these floating around in my camera bag before long. Pair these with a fast 50mm prime lens and you’ve got a very fun night photography setup.